Artificial boxwood mat squares bring a bit of green to your life all year long. Available in various styles and sizes, artificial plant squares make wonderful home or office accents. Choose from simple green artificial hedge mats like boxwood, hibiscus leaf and Podocarpus, or opt for artificial plants squares that burst with floral blossoms like hot pink or purple boxwood. Artificial boxwood mat squares may be the solution you're looking for if you don't have the extra time or green thumb to maintain traditional plants. Create a thriving indoor garden with fake boxwood mats, or use artificial plant squares for commercial displays and personal craft projects. However you plan to use Artificial Indoor Boxwood and Hedge Mat Square Tiles, we recommend mixing and matching for a dynamic, eye-catching look. Browse our selection today! For questions on Artificial Indoor Boxwood and Hedge Mat Square Tiles seen online, or for questions pertaining to custom projects, please call toll free: 1-888-320-0626, 7am-5pm PST, Mon.-Fri.
Decorate homes and offices with artificial boxwood mat squares and enjoy beautiful faux plants without the hassle of upkeep. Lovely and realistic fake boxwood mats mesh with any decor and add a touch of brightness to interiors. On top of aesthetic value, artificial hedge mats and artificial plants squares are also highly versatile in terms of application options. Mount fake boxwood mats to partitions for crafting an indoor green wall, or apply artificial boxwood mat squares on a block of Styrofoam to fashion a striking faux hedge. Create a lush indoor garden with a variety of artificial plant squares. Artificial Indoor Boxwood and Hedge Mat Square Tiles by Artificial Plants Unlimited include an option to mix and match from boxwood, hibiscus leaf and other alluring options to create your own fully original display. Unlike a live garden, artificial hedge mats require little-to-no maintenance and look vibrant in every season. Artificial plant squares brighten commercial and residential spaces in a variety of ways. Show your artistic side by framing artificial plant mats and hanging them as innovative ''green'' art. Layering various artificial plant squares in a montage of texture and color will have viewers marveling at your inspired garden art arrangement. Artificial boxwood mat squares are also great for decorating restaurants and retail displays. Commercial designers and small business owners can easily envision vibrant artificial plant squares as a lively backdrop for professional passions. Fake boxwood mats make striking indoor green walls along a bar, in the reception area at a beach resort or as an alluring accent to tag on a trade show booth. However artificial hedge mats are utilized to enhance business ventures, they will certainly be drawing attention for all the right reasons. For Artificial Indoor Boxwood and Hedge Mat Square Tiles, our customers select from several options including flowering pink and purple boxwood. Bright colors pop against the soothing green shade to create pleasing patterns. If simple green is more to your liking, there is an array of artificial plant mats with green-only foliage to suit your needs. Select from grass-like Podocarpus or lovely hibiscus leaf. For mix and match aspirations, fake plant squares in each of our available varieties are a natural complement to one another. Browse the selection of artificial plant squares to find a seamless design for your indoor decorating needs. For questions or individual project consultation, please call Artificial Plants Unlimited toll free at 1-888-320-0626, 7am-5pm PST, Monday-Friday. Bring a taste of the outdoors in with ornamental boxwood squares. Each square comes in a 12x12 tile and can be used individually or easily connected together for a larger groundcover. Ornamental boxwood squares, such as this sturdy and fire retardant option, can be used to fill in the ground on an indoor courtyard, add a lifelike area to a tabletop, or line a windowsill. With the customizable sizes of boxwood squares, the possibilities are endless. The quality construction means you'll have a perfect looking plant year round, no matter what happens. Boxwood squares can be easily put together to create artificial boxwood hedges. Simply connect the 12x12 squares around a block of wood or whatever shape you desire for a customizable and picture perfect hedge. This outdoor artificial boxwood features two shades of green leaves for a natural appearance that is perfect for residential and industrial projects. Outdoor artificial hedges are perfect for defining an area, providing privacy from neighbors, or hiding unsightly eyesores. These boxwood squares are made of quality material to resist fading and withering in the sun, giving you perfectly manicured hedges throughout the year. Turn your walls the perfect shade of green all year long with ornamental boxwood in a variety of shades and colors. 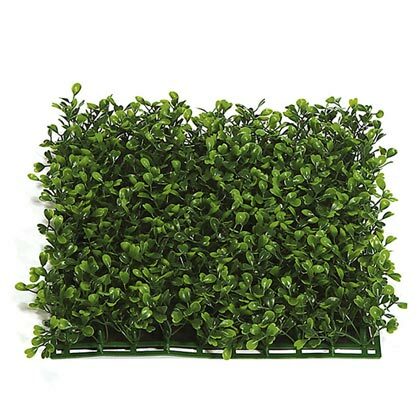 Boxwood squares are simple to install on the wall and don't require setting up a watering or feeding system. Instead, you can focus on creating a unique focal point of wall décor. Connect the boxwood squares to create a large wall of green, pattern them together in a checkerboard fashion, or create a frame around artwork or a TV. For an extra burst of color, use hot pink boxwood or purple boxwood. Boxwood squares are a modern addition to any area and can be customized to match your space and style. A natural and beautiful look is possible without the stress of plant maintenance. Let your imagination run wild with ornamental boxwood for an easy look that provides luxurious living.